The site has been occupied by a number of large manor houses since the 9th Century. The present house was built around 1668 by the London Banker James Hoare, bringing with it associations with Charles II and Nell Gwynne, who lived in a cottage by the bridge to the Hall. The Hall subsequently passed through various hands, and during the latter part of the 19th century was occupied by a succession of farmers. However, about 1905 Lady Randolph Churchill, as Mrs. Cornwallis West, came here to live. Her son, Winston Churchill, became a regular visitor. During the 1930s, Sir Nigel Gresley, of the London and North Eastern Railway, was in residence. He was responsible for the A4 Pacific steam locomotives, one of which, Mallard, still holds the world speed record for steam locomotives of 126 mph (203 km/h). Rumour has it that the name came from the ducks in the moat. In September 1939, the de Havilland Aircraft Company established the Mosquito design team in the Hall, the prototype Mosquito, E0234/W4050, subsequently being built in the adjacent buildings. Nell Gwynne's cottage was the centre of a silk worm farm, which supplied the silk for the Queen's wedding and Coronation robes. After de Havilland left in 1947 the Hall slipped into a derelict condition. When Walter Goldsmith, a retired army major, purchased Salisbury Hall, he soon came to realise that it had been used by de Havilland during the war. On contacting Bill Baird, then in charge of PR at de Havilland at Hatfield, he discovered that the company had used it as the design centre for the Mosquito, and that Baird had squirrelled the original prototype away in the Fiddlebridge stores, just off the airfield at Hatfield. Having resisted several calls to burn the aircraft, Baird was delighted to find someone who could offer the old aircraft a home. de Havilland carried out basic restoration work at Hatfield, and Goldsmith accepted the aircraft back at Salisbury Hall in 1959. The prototype Mosquito became the first aircraft to be displayed at Salisbury Hall, and was followed by examples of the de Havilland Vampire and Venom in 1968. In 1970, the collection was joined by a further example of the de Havilland Mosquito, which had been donated by Liverpool Corporation, following its use in the film Mosquito Squadron. The collection was later expanded with examples of the single-seat Vampire, Sea Venom, Sea Vixen, Chipmunk and Dove all arriving by 1978. Additionally, the fuselage of a Mosquito FB6 arrived in 1976; it is now the only survivor of the most numerous sub-type to be preserved in Europe. The museum houses the fuselage of the last surviving square-windowed de Havilland Comet 1, the world's first jet airliner. The museum is the largest such museum devoted to one manufacturer in the country. The supporters' society has been responsible for the high quality restoration and conservation of many of the exhibits, starting with the Chipmunk in 1978, an airframe which was subsequently restored by members once more in 2003-2007. The supporters were also active in building a hangar to house the ex-Liverpool Mosquito in 1980, and then completely restored the aircraft, completing the work in 1990. The supporters society has also been responsible for work on Tiger Moth, Hornet Moth, Vampires, Mosquito 6, Heron, Dove and many other aircraft in the collection. In 2001, it was recognised that the prototype Mosquito was in dire need of conservation work, something that is continuing in a very detailed and careful fashion to this day with BAE Systems supporting the project. Current projects include the DH Rapide being restored to flight status, the DH88 comet replica, the Comet 1 fuselage, the Mosquito Mk 6 and the Sea Venom. G-EBQP, DH53 Humming Bird - Privately owned, original wings and empennage, fuselage built by DH Technical school. G-AVFH, HS121 Trident 2E — Cockpit open to visitors when staff are available. BEA markings. TJ118, DH98 Mosquito TT35 - Fuselage, with nose section removed, and stored. J-1632, Venom FB.50 — Ex G-VNOM - ex Swiss AF. Stored offsite. J-1790, Venom FB.54 - ex G-BLKA/WR410, ex Swiss AF. Store offsite. A number of historic de Havilland engine types are also on display. 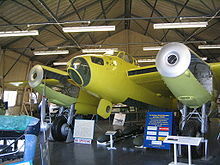 Wikimedia Commons has media related to De Havilland Aircraft Heritage Centre. This page was last edited on 24 August 2018, at 23:32 (UTC).